Testing conducted by a NY state agency showed that at 50 pascals (the pressure mandated in air infiltration testing) leakage was reduced by a remarkable 81%. The tests were performed by constructing six 4’x8’ test wall assemblies, 3 with and 3 without the AccuFrame foam gasket applied at the top and bottom plates. The result summary table below shows that not only was air infiltration reduced by 81% at 50 pascals but remained at this level up to 100 pascals before starting to fall off slightly. Heads up! If you're on mobile, you'll need to scroll to see the entire table! This type of testing is of course, not directly relatable to whole house savings due to the many other openings present in a modern home that must be sealed by other means. However, it should be kept in mind that the exterior wall gaps that AccuFrame seals extend around the entire house and can amount to approximately 300 lineal feet in the average house. Because AccuFrame is so economical, a contemporary home can be built using the AccuFrame® Energy Seal system for only hundreds of dollars. The low cost and air exclusion of AccuFrame allows for use of less expensive traditional batt-type insulating methods rather than more costly insulation options. AccuFrame® Energy Seal has been the subject of several engineering tests and has been found to be a highly effective air infiltration system under test conditions. However, the best indicator of performance is actual whole house testing using typical onsite construction methods that would be expected at a modern building site. In a recent test, Habitat for Humanity built two small homes (approximately 1300 sq ft each) in upstate NY, one with AccuFrame and one without. AccuFrame Home - built with AccuFrame® Energy Seal walls and no other air sealing methods. Benchmark Home -identical home built on the same building site to serve as the control. The benchmark home underwent an aggressive, meticulously installed silicone-caulking application to framing areas not generally sealed, to learn how AccuFrame would perform against stringent sealing methods. Third-party blower door testing @ 50 pascals, was conducted on both homes consecutively by certified HERS rater Newport Ventures on 2/14/17. In this particular study, AccuFrame® Energy Seal made the difference between passing and failing the new 3 ACH @50 pascals state energy mandate. New York States new energy code in Building Zone 6 mandates new homes must test at less than 3 ACH @50 pascals to obtain a 'Certificate of Occupancy' which is necessary for sale of the home, or undergo further air sealing and retesting until they meet the standard. When considered as total air flow, the AccuFrame home showed an impressive 30.4% decrease in air intrusion over the benchmark study home. 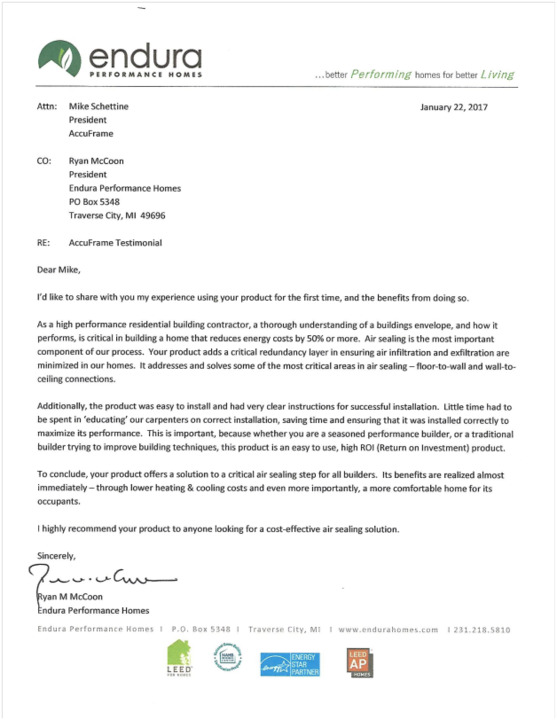 "Based on the testing done by NYSERDA, followed by the recent Whole House Air leakage tests at the Habitat for Humanity Schenectady homes, it appears that the AccuFrame product can provide much of the air leakage control needed for homebuilders using it in their homes to meet the tough new Air Leakage requirements of the ECCCNYS-2016." "I like the fact that it not only meets todays threshold; it exceeds the new codes for 2018." Endura Performance Homes (Traverse City, MI 49696) is a market leader in energy efficient design and construction. Endura employed AccuFrame® Energy Seal in the recent construction of two houses. Endura used AccuFrame in addition to several other effective insulating products and achieved outstanding results in terms of air isolation measured with blower door testing at 50 pascals. In response to these results Ryan McCoon, Principal, Endura sent a testimonial. Click the button below to view it. AccuFrame needs to be continuous on all exterior walls to ensure optimal performance. Accidental tears, rips and seams can be repaired with clear silicone.